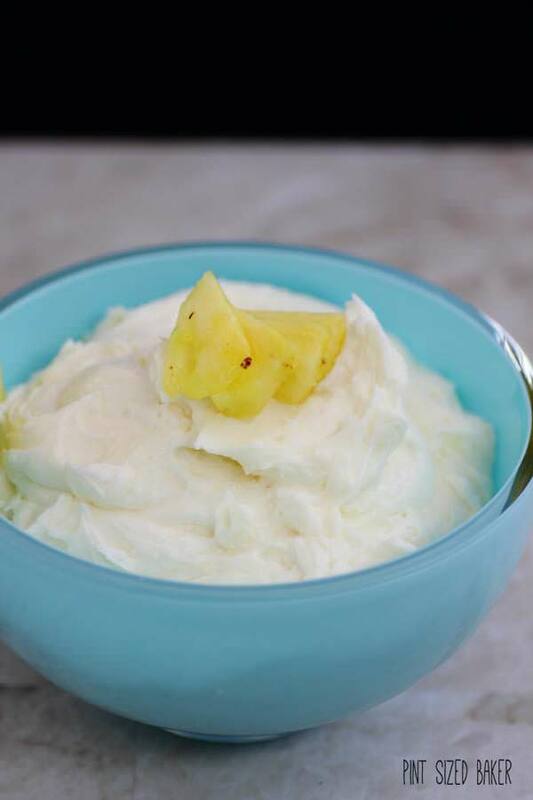 This is a light and refreshing Pineapple Frosting that is perfect for a hummingbird cake or and angel food cake. Frosting should be quick and easy. It should also be a sweet and delicious topping for cakes and cupcakes, brownies, cinnamon buns, and cookies. 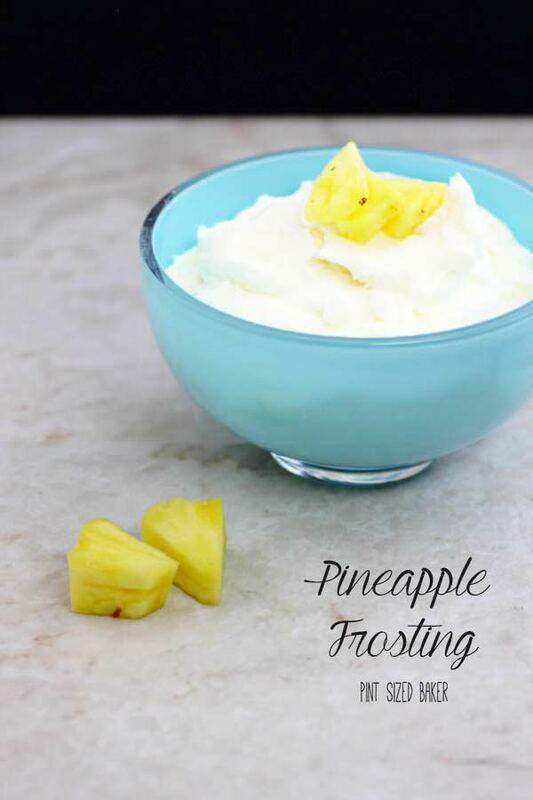 This is a perfect pineapple frosting that you can use in various ways. It’s an easy recipe that’s great for a special occasion. 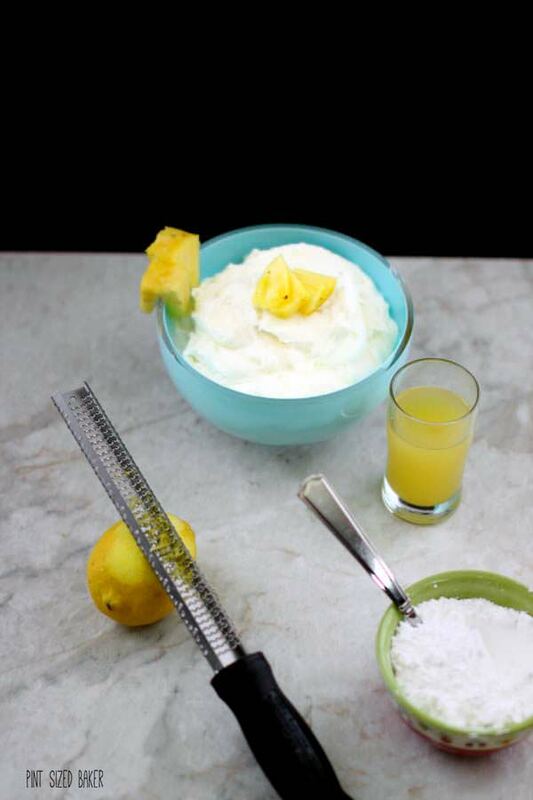 Light and refreshing Pineapple Frosting makes a great topping for cakes, cupcakes and cookies! Place the shortening and butter into your stand mixer with the lemon zest and salt. Mix until smooth and incorporated, about 2 minutes. Add 2 cups sugar and ¼ cup pineapple juice and combine. Continue to all in the remaining sugar, juice and cream until thick and at the consistency you want. Add more sugar if you want a thicker frosting or more cream if you want a thinner frosting. Store in an airtight container and place it in a cool place overnight. I love a fruity frosting just as much as I love a chocolate frosting. Don’t get me wrong, there’s a time and place for chocolate, strawberry and vanilla frosting – it’s just a matter of knowing when you want to use each flavor. I made this pineapple frosting to go on a Hummingbird cake which is full of pineapples and banana flavor. It was the perfect match! Like I said, this is an easy recipe to make. There’s powdered sugar, lemon zest, and pineapple juice added to a shortening base. Yes, sorry, it’s shortening… You could swap out for 100% butter, but the shortening will “crust” over better and give you a dry outer coating in about an hour. Shortening also helps to keep the white frosting white and let’s the full pineapple flavor come through. You’ll survive. Trust me. I hope that you give this simple frosting a try. It’ll be perfect whenever you are in a tropical mood and want to relive your trip to the islands… For me, that’s always in the winter when I’m longing for the warmth, sunshine, and fruity drinks on the beach. 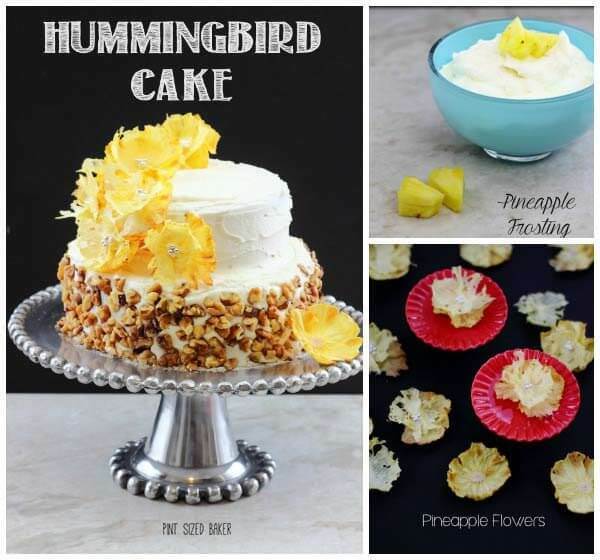 This recipe is part of a recipe series including a Hummingbird Cake and Pineapple Flowers. This sounds so yummy. This would be really tasty on carrot cake. Pineapple frosting on a carrot cake? I don’t know, but please let me know if you make it!